San Cristobal and the islands around it are well known to be the perfect place to snorkel. Here we can enjoy a rich undersea world. Don’t miss this opportunity to swim next to the beautiful and colorful animals. Lets enjoy the life. Today the adventure begins! As soon as we arrive in San Cristobal airport, and we passed the National Park checking point, we will be warmly received by our naturalist guide. Later on, we board our transport that is going to take us to the San Cristobal Highland area. The Junco Lake or el Junco, as it is called by locals, is an inactive volcano that has a fresh water lake where frigate birds and Bahamas ducks rinse their wings from the salt. This will be our first approach to the amazing view of Galapagos and its wildlife. Here, we will have our first delicious lunch at the archipelago. Moving on in our daily journey, after an approximate hike of 1 hour, we will have the opportunity to watch the famous Galapagos Giant Tortoises in their natural habitat. Where? At the Galapaguera Breeding Center. This center, run by the Galapagos National Park Authority, allows us not only to watch these magnificent tortoises but also touch and see some of their eggs. This visit is ideal for understanding the behavior of this massive animal that may weigh up to 200kg (440 pounds) and live up to 150 years. After this amazing contact with the wildlife of Galapagos, we will move on to Puerto Chino. This is a breathtaking beach where we can lay down or having a sunbath. Once we were astonished by the Galapagos first overview and the impressive animals, we are going to reach our hotel, where we will rest after a long but rewarding day as well as having a delicious meal. IMPORTANT NOTE: We strongly recommend to take the first flights to Galapagos because we will be able to land before midday and do all the program for this day. Bay. If we snorkel, we have the possibility to swim among hammer sharks. But, hold on! There is not only clear water and colorful fishes, there are also interesting birds such as the Galapagos Hawk or finches.Today, and depending on the activities and the group, we will have an unforgettable lunch on board. After this unforgettable experience, we will go to Punta Suarez. This rocky land requires a bit of effort by us, but firstly we have to wear comfy shoes or boots for being able to enjoy the 2 – 2:30 hours trail. Don´t worry! The effort will be more than rewarded. Here we will watch many species of birds like the blue-footed and red-footed boobies, hawks, finches and the Galapagos doves. If we are traveling between May and December, we will be able to see the albatross colony. At the end of it, there is another wonder of Galapagos waiting for us into the cliffs. There is the impressive blowhole of water that height up to 20m or more (50-75 ft). It like looking a geyser in the middle of the Pacific Ocean. This is the most complete tour that we can do in San Cristobal because we will navigate all along the island. The first spot to visit is the marvelous White Rose Bay (Bahia Rosa Blanca). This place is not as visited as others in San Cristobal, so it is an uncrowded area where we can deep into the crystalline water, do snorkeling and watch colorful fishes, manta rays, sharks, seahorses, and many other species. After enjoying this pristine bay, we move on to Punta Pitt, where we are going to fish, if we want. Also, we will be able to watch the red-footed boobies overflying us. Then, we continue Sardine Bay (Bahia Sardina) where we not only be able to continue swimming and snorkeling but also we will be able to lay down on the beach and enjoy some of the shadowed areas that this bay offers us. The journey continues, and after a relaxing time in Sardine Bay, we arrive at Punta Pucuna, after a 30 minutes hike approximately. This place has been recently opened by the National Park Authority for tourist, so we will see the lava ground as it has been originally formed by centuries. The human being has not affected or modify this land, so it is a unique and untouchable place. Because of the lava ground, we must wear comfy and resistant shoes for the walking around the island. After being enchanted and astonished by the geological jewel of Punta Pucuna, we are going now to Cerro Brujo, which is another rocky formation, but this one has a tunnel where we can go into and watch many other animal species endemic from Galapagos and we can take beautiful pictures. Finally, we visit our last spot in this 360º tour which is Kicker Rock. This highlight of Galapagos will offer us the possibility to be mesmerized by the rich marine wildlife and also be among the endemic Galapagos Shark. This tour is ideal for discovering all the jewels that San Cristobal has, all in one single day, with many activities and relaxing time as well. Note: The lunch will be served on board. Today our adventure begins at the Baquerizo Moreno Dock early in the morning. We are going to be by the hand of our bilingual guide, who will help us board the zodiac that will take us to the Galapagos Hopper catamaran. We will navigate the west side of San Cristobal Island, so we will be able to watch frigate birds and the unique marine iguanas. With a little luck we will be able to spot manta rays and dolphins jumping amongst the sea alongside with other marine wildlife. 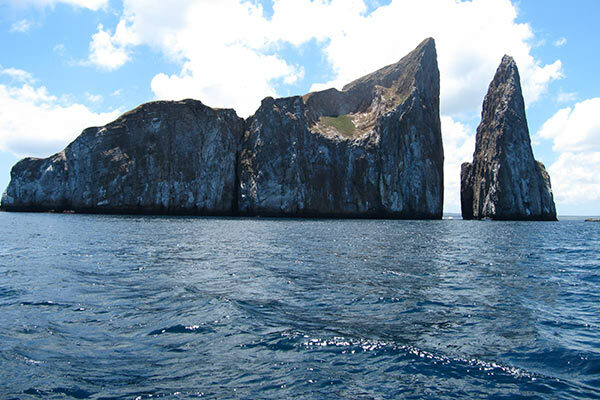 Our first snorkeling excursion will take place at Kicker Rock also known as the sleeping lion. This astonishing rock is a tuff cone eroded into twin peaks. There is vast wildlife living in its surroundings, it’s cliffs are home to blue footed boobies and other sea birds. In terms of marine life some of the species that we can find at this place are sea lions, reef fish, rays, hammerhead shark, sea turtles and much more. For lunch we will board again the Galapagos Hopper and will enjoy a succulent 3 course meal. Also here, we will be served with soft drinks, coffee, tea and infusions. After enjoying Kicker Rock, we will disembark at the beach where we can walk in search of coastal birds and sea lions, or relax and take a sunbath. If we chose the option of discovering the shore by foot, we can see mangrove forests. Later we can dip into the turquoise water before returning to the Galapagos Hopper catamaran for our navigation back to Baquerizo Moreno Dock in the afternoon. Today our adventure begins at the Baquerizo Moreno Dock early in the morning. We are going to be by the hand of our bilingual guide, who is going to help us to board the zodiac that will take us to the Galapagos Hopper Catamaran. Our navigation will last approximately 2h15 minutes. The fun starts with a wet landing at the Golden Sand Beach (Playa Arena Dorada). Punta Pitt is an eroded volcano, it is one of the few places in Galapagos where we can spot the three species of boobies, the blue and red­footed boobies and the Nazca boobies. The excursion at Punta Pitt is on rocky terrain, so we should be prepared for the two hours hiking with comfortable shoes to avoid any inconvenience and being able to enjoy this unique landscape. After hiking around the site, we will be able to do snorkeling at the Pitt Islet. Thus, we will watch an amazing variety of fishes, and with luck we will snorkel among sharks. As soon as we board again the Galapagos Hopper Catamaran, we will be received with a refreshing and delicious snack, and for lunch we will enjoy a three course meal. Also, we will have soft drinks, coffee, tea and infusions available aboard. Sadly, our daily adventure in Galapagos arrived at its end! Our guide will assist us in our return flight or to move on to our next experience in Galapagos, hopefully, onboard of an expedition cruise like the Boutique Yacht Galapagos Sea Star Journey and the First Class Catamaran Galapagos Seaman Journey.